phpFox provides several gamification tools for your social network to encourage members to have more interaction in the community. One of them is the Activity Points system, in which you reward members by giving "virtual points" for each of their activities. You can fully customize the points your users receive on each action from inviting, commenting, and creating a new item. You can also configure the conversion rate to convert the activity points to actual rewards such as real money. Thus, there are many ways to use this system efficiently, such as promote some active users to be a moderator of the site, give "real" awards back to some active users or to users whose points over a threshold, etc. 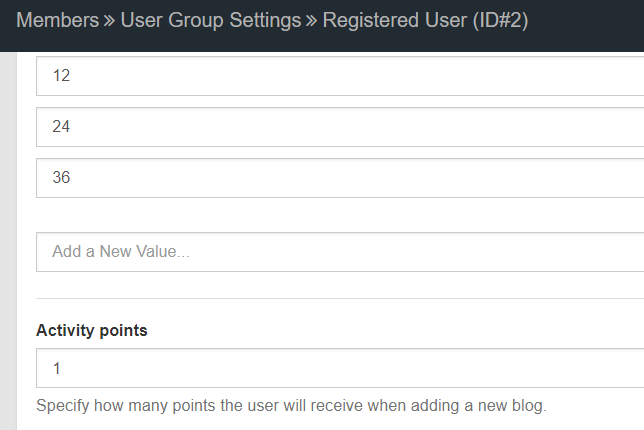 In user group settings of each app, there is a place to configure the number of activity points your users will receive when creating a new item. Therefore, it's very convenient to lead the focus of your community to a topic you want by giving more points than the other ones.